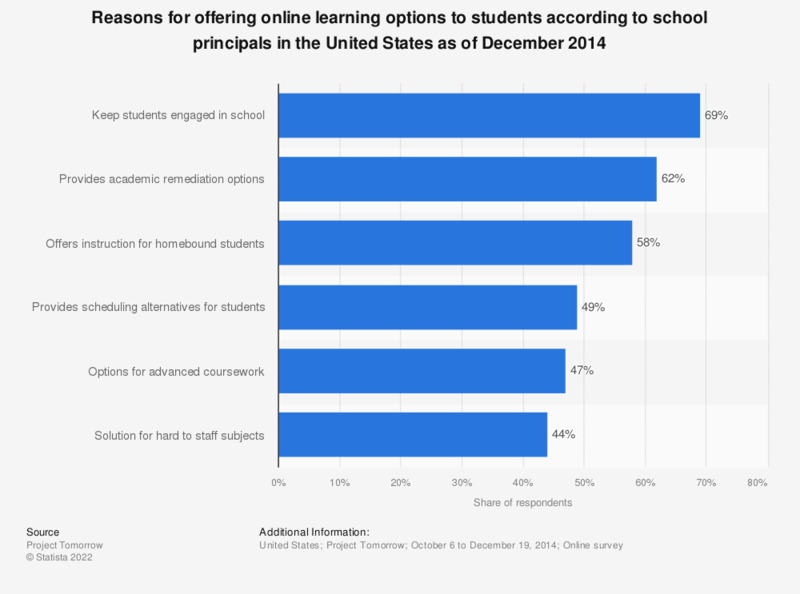 This statistic presents the leading reasons for offering online learning options to students according to school principals in the United States as of December 2014. During the survey period, it was found that 69 percent of responding U.S. school principals did so in order to keep students engaged. In fall 2014, Project Tomorrow surveyed 431,231 K-12 students, 35,337 parents, 41,805 teachers, 2,485 librarians, 680 district administrators, 3,207 school administrators, 442 technology leaders, and 6,653 members of the community representing 8,216 public and private schools from 2,676 districts. Statistics on "Hispanics in the U.S. Part II"